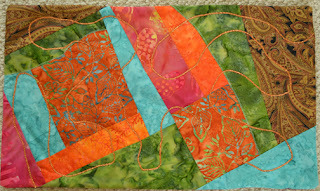 I have been having great fun with Jeanne Simpson's Quilt 2012 Challenge. We are given a theme every Sunday and have the week to complete a 20" x 12" art quilt. Jeanne calls it a trolley challenge as you can choose to participate as much as you wish - a great idea for me with my travels. This past week's theme was "Cinco de Mayo" and my contribution was appropriately colorful. Be sure to check out the other submissions on Jeanne's site. 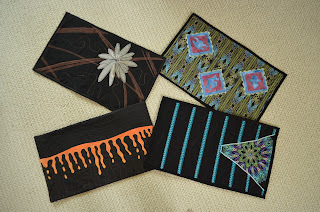 I am getting quite a nice collection of small art quilts from the challenge. Fortunately, they fit perfectly on a table in our foyer so I am switching them on and off and enjoying them as I pass by. I am using the challenge as a vehicle to play with different techniques. It was suggested that we construct our quilts quickly, intuitively, and with an air of experimentation. I am really enjoying the freedom to experiment within the structure of a theme. Anyone is invited to jump on the trolley and try a few weeks. Themes are posted on Sunday evening. Hope you will consider playing! Great pieces, Judy! Looks like you have been having fun. May look into it later in the month. What a great challenge! I really like your pieces!! Even though I can't participate right now, I will have to follow along. I like to see them together as you have them, and I agree that they are a great vehicle for trying out new techniques and compositions. Brava. Thanks, everyone. I am so enjoying the challenge. Have had to drop off the trolley for a week or two but expect to be back on board by end of May. Feeling the benefits of my explorations in my other projects.